The artist Jelili Atiku (b. 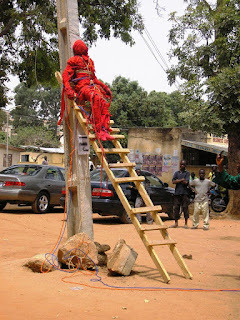 1968, Ejigbo, Lagos) has built a substantial reputation in the past decade as, arguably, the leading performance artist working in Nigeria today. Trained at the Ahmadu Bello University, Zaria and the University of Lagos where he respectively earned a bachelor’s and master’s degrees in sculpture, Atiku began enacting politically-charged public performances in 2004, in Zaria and Lagos to wide popular acclaim. In doing this work, he has faced tremendous personal risk and has, for years, received little support and acknowledgment from the Nigerian art world. In more recent years, however, his performances, have received increasing critical acclaim and have taken him to major events, festival and exhibitions in Africa, Europe, Asia and the Americas. In Nigeria’s fraught socio-economic and political environment, Atiku’s performances are nothing but unprecedented radical interventions and artistic statements. His art is motivated by the ethic of speaking truth to power at the local and national levels, which in turn explains his willingness to take his work to the unknown but ever present dangers of the Lagos streets, even as he champions the cause of performance as an artistic genre in Nigeria. It is important to emphasize the fact that in describing Atiku as a performance artist, we must understand that his work transcends that genre, which has normatively been limited to the sanitized, elitist space of the gallery or the museum—controlled environments where the artist and his audience are united in their mutual investment in the integrity and autonomy of the work of art. When Atiku takes his performances to the busy and densely populated Ejigbo section of Lagos, he submits himself and his art to the vagaries of the uncontrolled public space. In doing this, he is compelled by an inner urge to directly interact with his neighbors and strangers about particular local, national and international socio-political events or issues that impact their lives and the body politic. According to the artist, he puts his work “at service of the prevailing concerns of our times; especially those issues threatening our collective existence and the sustenance of our universe.” Thus, one of his most recognizable works, The Red Series, draws attention to the state of insecurity and wasting of lives in Nigeria by criminal and state agents, while other projects, including his multimedia installations, have engaged political assassinations, environmental degradation and traumas of the postcolonial condition. But these enactments, because they combine an inventive range of costume, and intense dramatic action, constitute in themselves an inspired expression of the ineffable. And it is here that one sees the artistic inspiration for Atiku’s performance in the masking and ritual drama of the Yoruba and other African peoples rather than in the existentialist utopianism of, say, the Situationist International and performance artists inspired by them in Europe and the United States. For as in Yoruba masking, Atiku’s work thrives on the charged, organic, symbiotic relationship between the performer and his heterogeneous public—an interaction that can lead to ritual and aesthetic catharsis, but also sometimes to violence and bodily harm. It is the unpredictability of the public’s response and his vulnerability in the shadow of ever-present security agents that give his performance art its psychological and aesthetic charge.